A hearty, whole-grain porridge using amaranth and milk (easily vegan with non-dairy milk). Top with the bananas or try your own topping with whatever seasonal fruit you have on hand. Heat a pot over medium-low heat. Add the amaranth and toast for about a minute. Any longer and you risk the amaranth starting to pop (a fun activity but not what we’re going for in this recipe). Add in the milk, water, and salt. Bring to a boil and let simmer for about 25 minutes or more, stirring occasionally. It will look like the porridge isn’t thickening but it will happen quick towards the end. While the porridge is cooking, melt the butter in a small skillet over medium-low. Cut the banana into ¼” to 1/2 “ thick slices and place in the pan with the melted butter. Cook for a minute or so. Add in the sugar and a pinch of salt. Continue to cook until the sugar begins to caramelize the bananas, about 2 minutes or so. You want the bananas to cook just long enough to be soft but not lose their shape. Once the porridge and bananas are done, assemble the bowls. 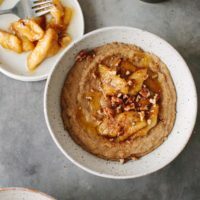 Divide the amaranth into two bowls and top with bananas, a sprinkle of cinnamon, cream, and a sprinkle of toasted pecans. I like to toast my pecans in the pan before I make the bananas. Simple add to the heated pan and shake until fragrant and starting to darken slightly. Remove from the pan and return to heat for the bananas. A little amaranth goes a long way. The serving size for amaranth is ¼ cup dry but I tend to eat a sizable breakfast. The old recipe called for soaking and while there are schools of thought that this is a must for every grain, legume, nut, and seed. I prefer the flavor of amaranth that has been toasted (which isn’t really feasible unless you soak, dry, then toast- a process I’ve yet to master timing for).